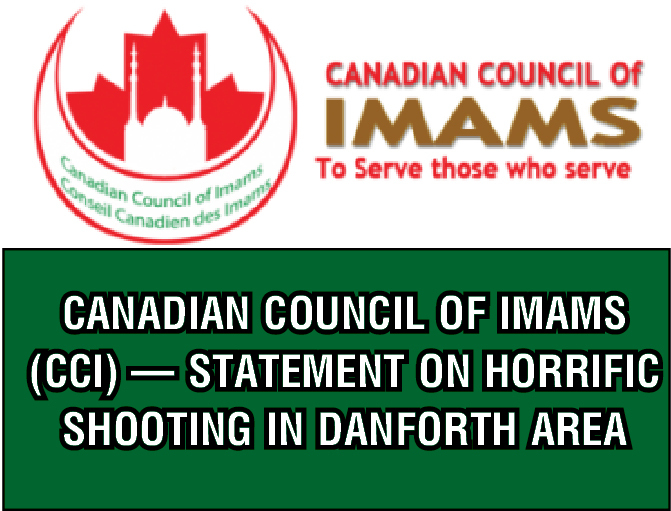 The Canadian Council of Imams (CCI) is deeply grieved by the horrific shooting on the Danforth last night. This senseless and unspeakable act of violence has no place in our society. Our thoughts and prayers are with the victims and their families who have suffered an unimaginable loss. We extend our deepest gratitude to the first responders and their swift, life-saving efforts as they rushed to the scene of the shooting as quickly as possible. The shooter's family has released a statement referencing his many years of struggle with severe mental health challenges. While we await the full investigation by the Toronto Police Services, this is certainly a cause for all us to make mental health a priority in our communities to help avoid terrible tragedies like this from ever happening again. We call on our membership and places of worship to dedicate programs and funds to benefit the victims of this tragedy and mental health initiatives. The Prophet said, "The most hated person in the sight of Allah is the most quarrelsome person."